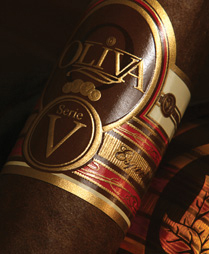 The Oliva Serie V ~ Ligero Especial handcrafted cigar is comprised of a complex blend of Nicaraguan long filler tobaccos. Blended with specially fermented Jalapa Valley ligero and finished with a high priming Habano Sun Grown wrapper, the Serie V cigar delivers a full-bodied taste while maintaining an unparalleled smoothness. This flavorful smoke exhibits rich coffee and dark chocolate tones with a subtle and well balanced spice presented throughout. Oliva's Serie V cigars are consistently awarded high ratings by the likes of Cigar Aficionado, Cigar Snob, Cigar Insider, and Cigar Journal.